As usual, too many things to share and too little time to write. Well, this time, I'm doing it. 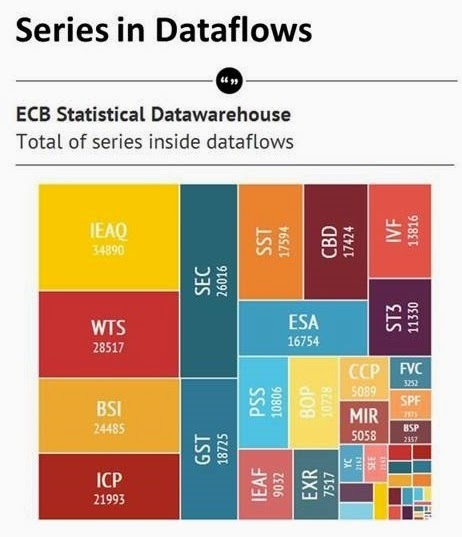 One of my data sources is the Statistical DataWarehouse (SDW) from the European Central Bank (ECB). That's funny because 12 or 13 years ago, I was feeding that ECB Warehouse while working for the French National Bank (NCBs). This warehouse can be queried with the use of the ECB front end, located here. You can also query it by using the REST services. That's my preferred choice for data processing automation and this article will developp this point. 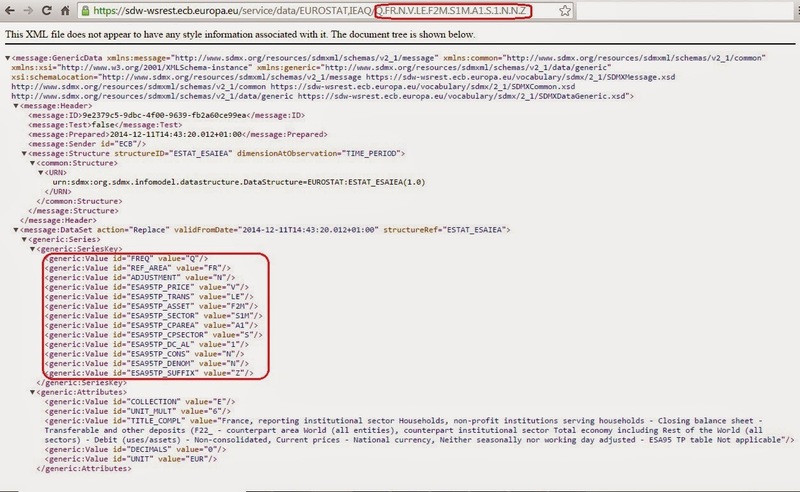 Before querying the data, let's have a quick explanation about the SDMX format that is used by the ECB. SDMX is an implementation of ebXML. Dimensions and attributes : dimensions for identification and description. Attributes for description only. Here is an example of what SDMX data is. This is an excerpt of a much longer file. Serieskey : giving all the values for each dimensions. Observation dimension : time, in this example. Observation value : the value itself. There is nothing easier for that : use the REST web services provided by the ECB. Query data : this is the interesting part for this article ! But let me write a quick overview now. It is very simple as sooon as you understood it. Let's write a REST query for some ECB data. First you need the base service url. Then, you need to target a resource. Easy, it is "data". Ok, let's go further, now we need to specify an "Agency". By default it is ECB, but in our example let's go for EUROSTAT. And we continue, now we need a serie name. For this example, let's go with IEAQ. Simple so far, now let's do the interesing par : the key path ! The combination of dimensions allows statistical data to be uniquely identified. This combination is known as series key in SDMX. Look at the picture below, it shows you how to build a serie key for targetting data for our on going example. 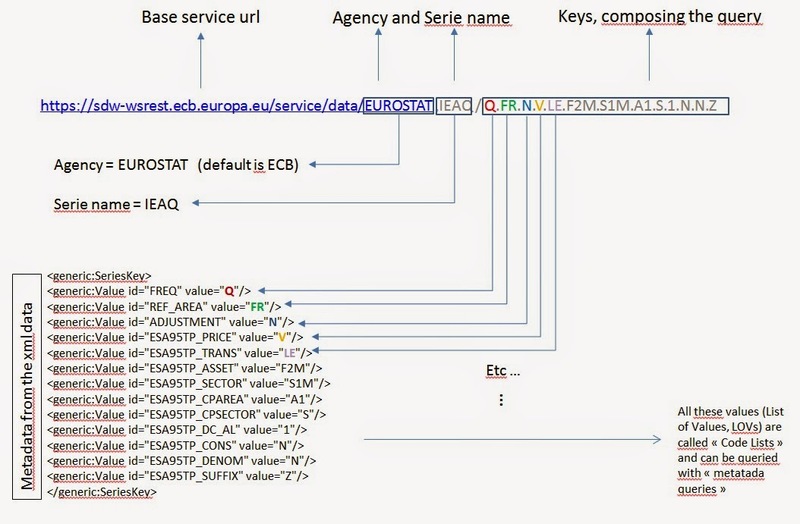 When looking a metadata from the IEAQ serie, we see we need 13 keys to identify an indicator. These keys are ranging from easy ones like FREQ (Frequency) or REF_AREA (country) to complex (business) keys like ESA95TP_ASSET or ESA95TP_SECTOR. Now we need a value for each of these dimensions, then "stacking" these values with dots (don't forget to follow the order given by the metadata shot). Another way for understanding is considering the keys as coordinates. By choosing a value for each key, you build coordinates, like lat/long, that identify and locate a dataset. I chose the cube representation below to illustrate the concept of keys as coordinates (of course, a dataset can have more keys than a cube has sides ...). 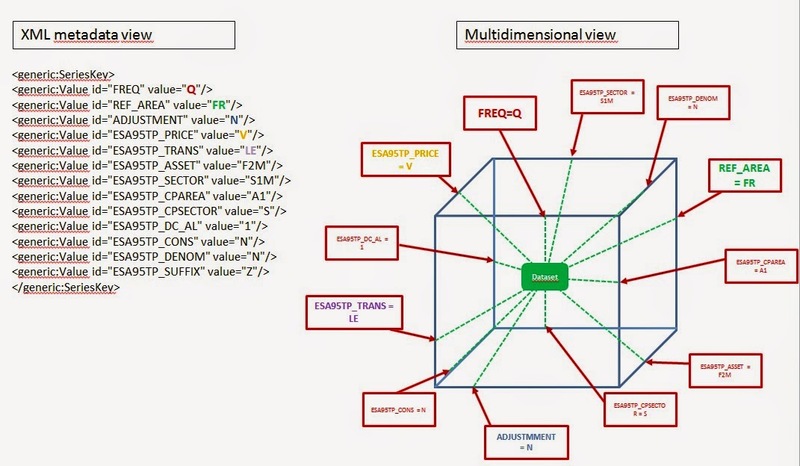 You can see how a flat metadata representation is translated into a multidimensional structure. To query the data, nothing difficult. Simply paste the complete URL into a browser, then after a few latency, you'll see the data. 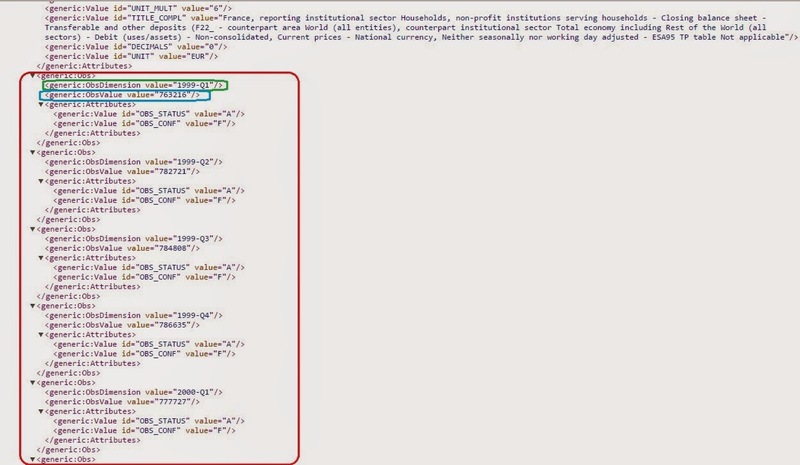 Here is the top of the xml answer, showing some metadata. And here is the DATA ! (2 snapshots for simplicity but metadata and data are coming within the same xml answer). In red, the data. In green, the time dimesion. In blue, the value ! Query and process the data ! Here I will introduce some shell code I used in a larger project, where I had to run massive queries against the ECB SDW and build a full data streaming process. 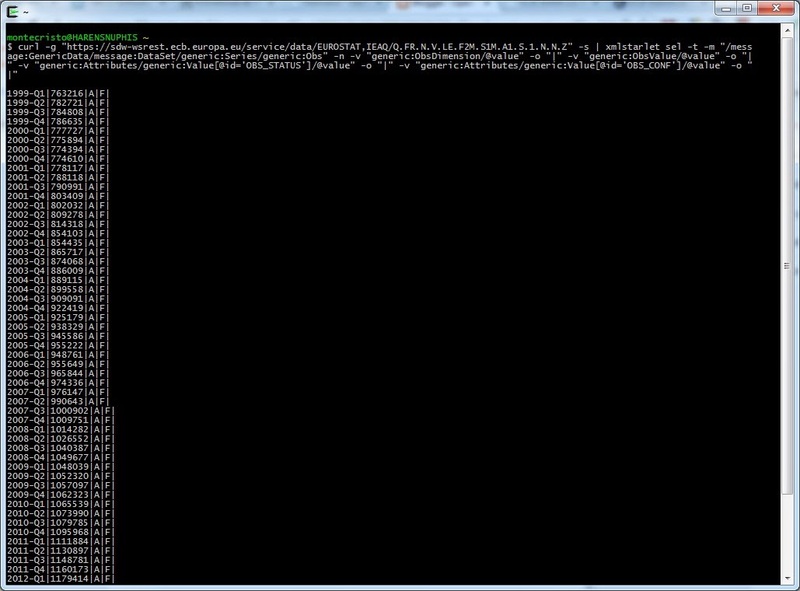 The command below with allow you to run a query and parse the data for easy extraction. I'm using the powerfull xmlstarlet software here. Have a look to this partial inventory I did recently. As you can see, the amount of data is important. learn how to build complex queries (I only gave a very simple example here).